This pieces will arrive gallery wrapped and ready to hang. Zhou Shu Liang continues to amaze. 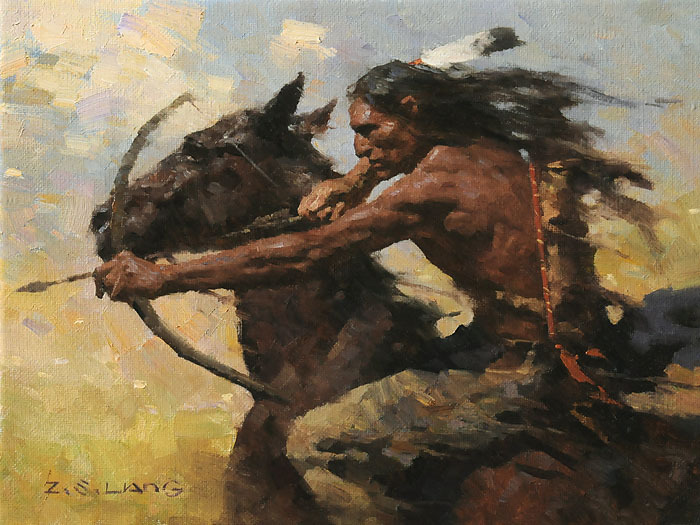 Always a powerhouse painter, he continues to perfect his subject and style through historical research of Native American cultures through reading, travel, interaction with contemporary Natives and improving his painting skills. We can’t imagine a more perfectly composed, action-packed SmallWorks™ by Z.S. Liang than this new Giclée Canvas Edition. “I'm trying to make my work more painterly and simplify the shapes,” says Liang. “It's an ongoing learning journey." Collector’s of Z.S. Liang can’t miss Hot Chase, a stellar SmallWork™. If you’re just becoming aware of Liang, this is a great place to start: affordable and quintessential Liang.